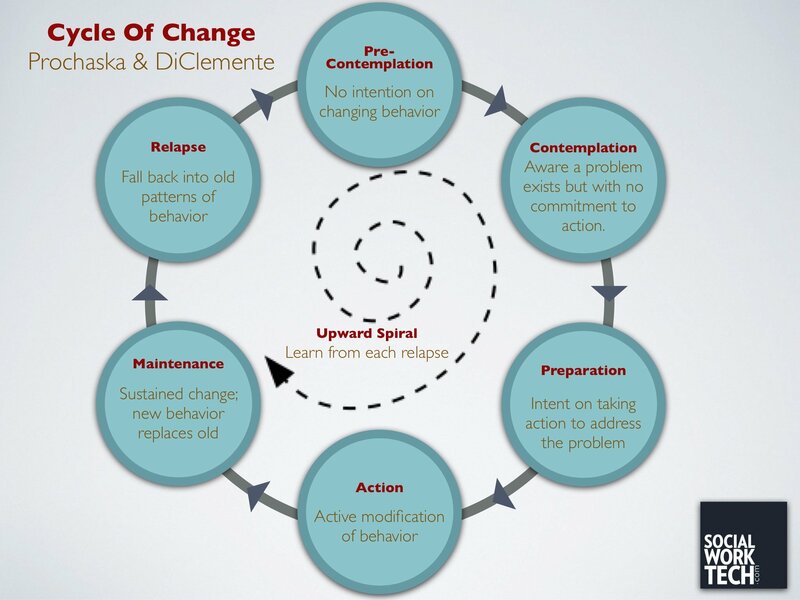 In the Cycle of Change, we understand that relapse is part of the process of recovery from addiction. Everyone falls off the wagon. We can expand the idea of relapse to apply to any effort at change. your fire, does it? No inspiration, no grit or spirit of I CAN DO IT. I will rise. We need to insert something more helpful into our cycle of change to help,us get back ON the wagon. If we can agree that relapse is natural and OK, then recommitting is also natural and OK. In fact necessary! constantly fret that s/he has veered off the trajectory, turning the flight into a literal guilt trip? No. They just steer the plane back on course. This is how you need to think of recommitting. It is a much more empowering way to get back on course than the traditional way, which is to deny your resistance and storm around shouting THAT IS IT. THINGS ARE GOING TO BE DIFFERENT FROM NOW ON. NEVER AGAIN. If you did literally fall off a wagon while it was moving, you would need a bit of extra energy to get back up on your feet and call the driver to stop. The energy required to recommit is about focus and prioritising. Let me give you a personal example. I constantly have to recommit to slow eating. If I have a creative idea for something while I am eating, my urge is to get my notepad out and start brainstorming while eating like Roadrunner. The old voice from my compulsive years is still there, whispering that eating fast will somehow get me into a very productive and manic creativite state. If my kids start bickering at mealtimes and I have to start playing the role of the UN, it is very hard for me to eat consciously. If I have lunch with an old friend I never see anymore, my excitement at seeing them makes me about 70% less aware of the food. I notice that eating fast creeps up on me after a few days of slower eating and the complacency that this can create. The good news is my baseline for unconscious eating these days is alot less fast than it used to be. Such is the power of The Pauly Principle. When I notice this, I recommit by choosing one of the slow eating games that provides the most structure. This is no time for Taste Detective or gamifying the challenge. There is relief in the work of delaying gratification. This is the time for the 1 Minute Mouthful (sit and wait a minute before I can put any food in my mouth) or Beat The Clock version 1, where I set a minimum time for a meal and stick to it. No games, lots of clockwatching. So can you set any rules to help you recommit? Things you can measure to show yourself that you are indeed back on course, and not just blowing a load of intentional hot air. I will write down 3 Cravings Busters on a card for my wallet and look at them if I feel tempted. This is an audio I made when I was really tempted to have some junk. Making the audio itself was a way to recommit.